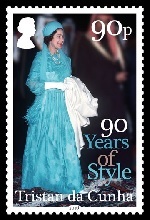 This set of stamps celebrates the 90th birthday of Her Majesty Queen Elizabeth II by showing various dress styles she has worn during her lifetime. 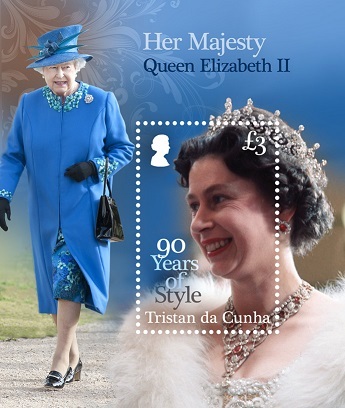 The Tristan da Cunha Post Office is delighted to celebrate the 90th Birthday of Her Majesty Queen Elizabeth II on 21 April 2016 with the release of 4 stamps and a souvenir sheet. Her Majesty celebrates two birthdays each year, her actual birthday and her official birthday on a Saturday in June. Official celebrations to mark a Sovereign's birthday have often been held on another day in the summer to ensure good weather for the 'Trooping the Colour' Parade, also known as the Birthday Parade. On Tristan "Queen's Day" is held in February or March, when the weather is good, as on Tristan June is in the middle of winter. The Queen usually spends her actual birthday privately, but as 2016 is such a milestone birthday The Queen and Members of the Royal Family will attend a pageant celebrating The Queen's life to be held at Home Park in Windsor Castle in May, a thanksgiving service held at St Paul's Cathedral on 10 June as well as the Queen's Birthday Parade on Horse Guards Parade on 11 June. 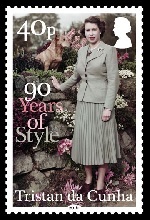 Last year Her Majesty became Britain's longest reigning monarch and both as Princess and Queen she has presented the world with 90 Years of Style. During the war and post war years when austerity and rationing lingered across the land she was famously thrifty, wearing hand-me-downs, her mother's re-worked clothes and off the peg outfits. One of her most famous outfits was of course the dress for her wedding in 1947. This wedding was perhaps the start of royal wedding fever, yet just like everyone else in 1947 the Princess Elizabeth had to fund the material for the dress with clothing ration coupons, although the Government kindly allowed her 200 extra coupons! Famously, people sent in their own coupons to help the Princess out, but they were sent back with a note of thanks as it was illegal for her to use them. 35p - The Queen Queen attending a garden party in Melbourne, Australia, 1954. Central Press/gettyimages. 40p - The Queen with dogs at Balmoral Castle in Scotland, 1952. Lisa Sheridan/gettyimages. 90p - The Queen diplomatically dressed in a long dress and turban style hat during an official tour of Saudi Arabia, 1979. Tim Graham/gettyimages. £1.10 - The Queen attends a service of celebration to mark the 400th Anniversary of the King James Bible at Westminster Abbey. Mark Cuthbert/gettyimages. £3 sheetlet - Border: The Queen visits Gloucester 2009. Mark Cuthbert/gettyimages. 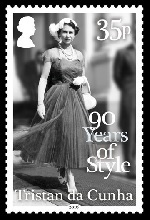 Stamp: The Queen is pictured at the Royal Variety Performance in London 1962. Popperfoto/gettyimages. 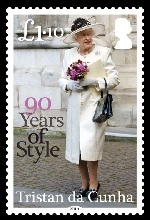 First Day Cover - The Norman Hartnell drawing on the First Day Cover was for Princess Elizabeth's "Going Away Hat". Arthur Tanner/gettyimages.